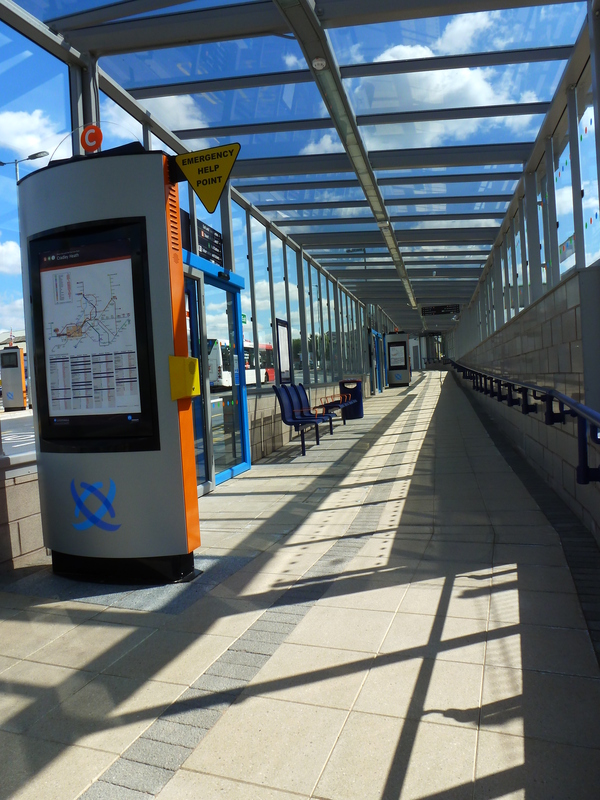 A new transport Interchange has opened at Cradley Heath. Phil went mooching…. Heaven knows it’s difficult to try and convince non-regular bus users to come across to the enlightened side. Ensconced in their private tin can, free to scream Meatloaf’s “Bat out of Hell” to themselves and no one else (fair enough), why should they do the “bus thing”? Long have I wittered on about “the package” that proves the bus’s case, but one rather large consideration is the facilities that prevail. Bus stations can be dingy affairs, losing potential passenger’s custom (and their will to live) before we’ve even begun. So a new quality facility is always welcome – if only to give me a bit of breathing space in the pub in my never-ending quest to get people to see the light. Cradley Heath – deep in the heart of the Black Country – is the new recipient of such a thing. Lying adjacent to the Snow Hill railway line, it is a perfect opportunity to showcase the possibilities of integrated transport. Yes! Here in Britain – where those who would shout us down might claim it is impossible. The new Interchange achieves much of this. It’s shiny, attractive and practical – in short, it’s very good news for locals. It might never have happened. When Transport Authority Centro won a large pot of gold from a Government fund, it was primarily meant for new facilities at the nearby giant Merry Hill Shopping Centre (dubbed “Merry Hell” by those of us who decry the nightmare traffic congestion the place generates). By golly, it needed them. The bus station is far from big enough and the surrounding roads are crying out for a solution that lets buses glide through, avoiding the bumper-to-bumper scenario that regularly afflicts the site. The plans to upgrade the bus station and access at Merry Hill were largely watered down, thanks to the project being dependent on Merry Hill’s then owners Westfield stumping up cash of their own to add to the balance. But they sold Merry Hill to another operator and the dream of good bus facilities in Merry Hill disappeared up the proverbial exhaust pipe. We have been left with one short stretch of bus lane in Merry Hill (as you leave the centre), and even this isn’t used by the majority of buses turning right to access nearby Brierley Hill. All very disappointing. So the large penny pot got reallocated to Cradley Heath. Some argued that the Interchange didn’t need upgrading, but, in 10 months, it’s been transformed into a beautiful swan. There is now two-way operation inside the bus station for the first time, with the main stands being fully enclosed and weather-resistant. There are two stands with outdoor shelters for the new opposite direction flow towards Cradley Heath town centre. 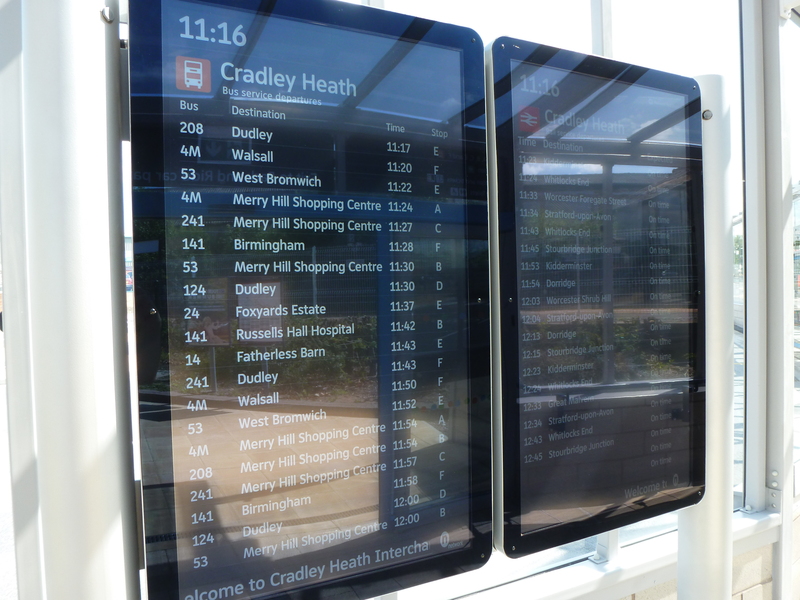 Electronic information looks even more smart and cleanly presented than recent bus station upgrades in Wolverhampton and Stourbridge (although none of it seemed to be operating in “real time” when I was there). Paper timetable information is also on stands, which is a good idea, given the “record” of electronic displays elsewhere across the Centro area…When it works, it looks really impressive. There are also bus and rail departures being shown side-by-side on screens. 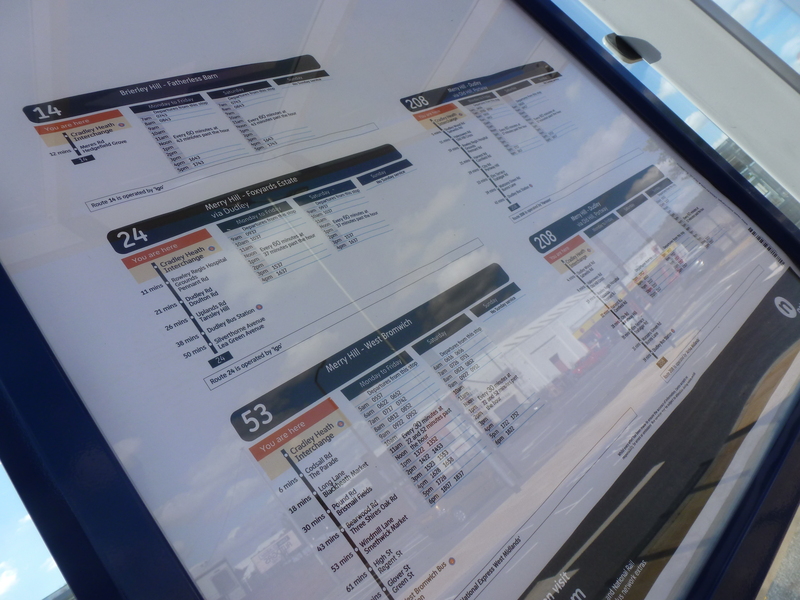 Commuters arriving in the adjacent car park are presented with bus/rail information as they enter the Interchange. 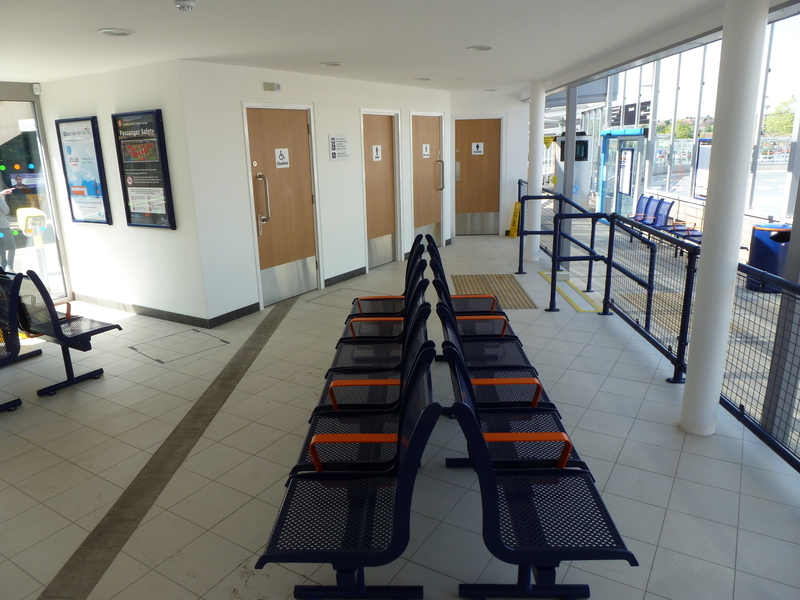 There is also a very attractive waiting area adjacent to the railway entrance, with toilets available. It’s all very splendid, and for those who use Cradley Heath Interchange regularly, it’s great news. Apparently, it’s one of the top Interchange points for those using “PlusBus” tickets from outside the area, as there are regular buses to Merry Hill, just up the road. It would, however, be remiss of me not to point out that, whilst this is all very grand, there are a couple of issues – one quite small and another fairly fundamental. 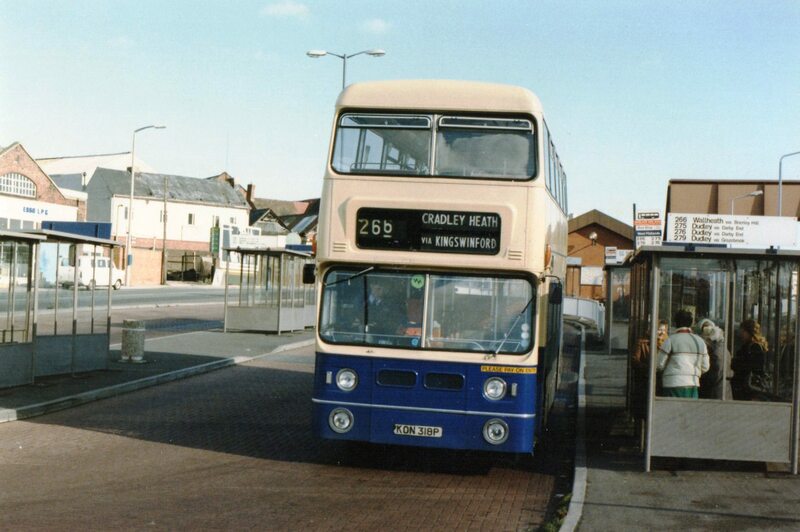 Buses heading towards Cradley Heath High Street and onwards used to stop over the road in Forge Lane. Now, whilst a safety consideration might have been removed by allowing buses to enter the Interchange (therefore removing the need for people to cross the busy road) and granting users the facility of boarding within the bus station, it has now created a rather awkward “turn right” out of the bus station. I sample this on a 141 heading towards Birmingham, with our driver eventually having to edge his way out and wait for someone to flash him out. Otherwise we’d have been there for some considerable time. And that was off-peak. I think this may be an issue during busy peak times. The other more fundamental consideration is that there are bus routes that don’t serve the facility. 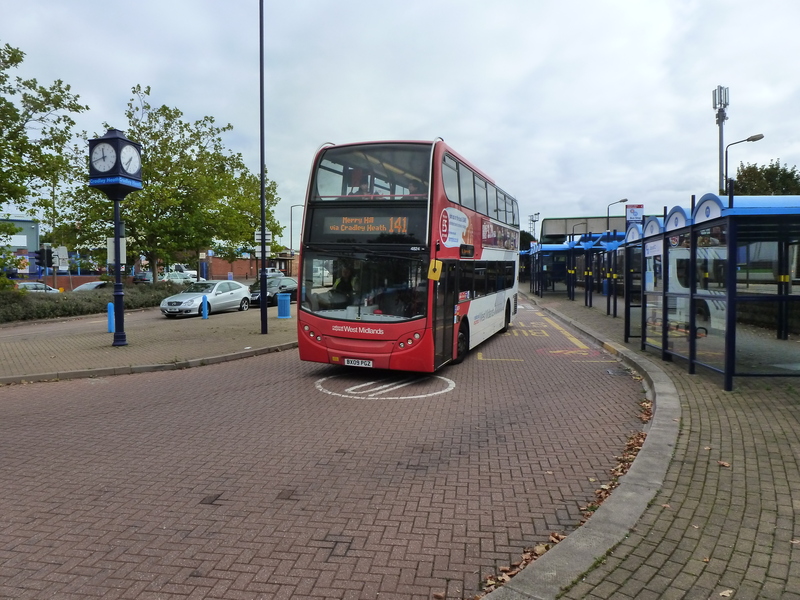 National Express West Midlands’ 243 – the most direct to Dudley – has long since stopped coming down as far as the Interchange, instead preferring to loop around the Timbertree estate after serving Cradley Heath High Street on its way to the bright lights of Merry Hill. Similarly, Diamond’s 4 buses per hour on the 002 route and Hansons 004 disappear out of sight just down the road. This is a conundrum. I’m not advocating these routes should do timely and costly “double-runs” to serve the Interchange – that might seem silly to users on the routes concerned – but at times there seems precious little activity in the facility. There are some important services here, such as the 4M to Oldbury, West Bromwich and Walsall, and the 141/241 combination towards Halesowen and Dudley (the long way) or Birmingham (also the long way compared with the train adjacent). But I digress. Cradley Heath now has a state of the art Interchange facility, and in an age of austerity, it’s no mean feat to have seen Centro erect similar quality at Wolverhampton and Stourbridge in recent years. Creating real quality public transport facilities is in everyone’s interest! You’d put bus route numbers right up there on the list of most boring things to talk about in the pub, alongside manhole covers and lamp post design. But…(and you knew this was coming) – it’s actually really important. Stick with me here. 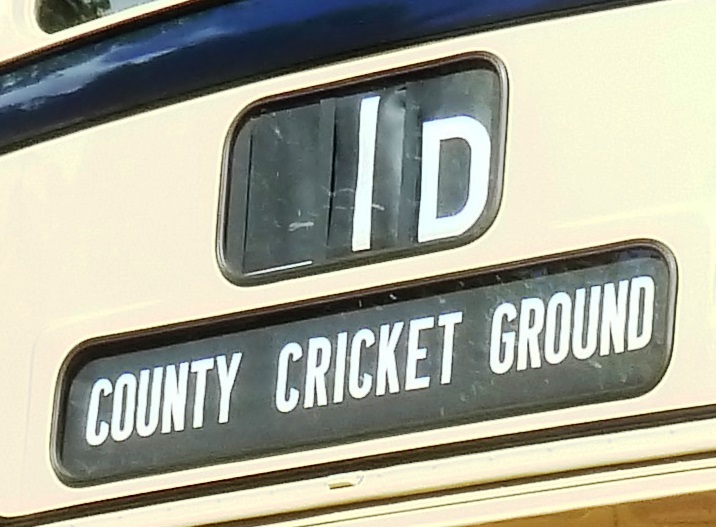 How on earth is a humble bus number occupying my mind? As ever, it was an innocent observation that got me thinking. Seven years ago, in my local area, Centro, “in partnership with” (which sounds much more cuddly than “in conjunction with”, which in turn is so 70s..) the bus operators, launched a series of “network reviews”, in which all far-flung corners of Centroland were examined and re-thought out. They got more “daring” as they went on, with long-established route numbers cast away in favour of “starting again”. Many of these route numbering systems were historical. For example, numbers in the “2xx” series were usually Dudley / Stourbridge area routes, 3xx Walsall, 4xx Sandwell, 5xx Wolverhampton, etc. One and two digit numbers were the preserve of Birmingham. Since the reviews, many areas now have their own “mini networks”, with numbers often duplicated, so there are 2 versions of route 6, for example. Does this matter? I have a split personality on this. The unashamed geek-like enthusiast in me shudders at the prospect of losing historical artefacts like this. I still have this warm glow every time I visit the Black Country Museum and see the 1963 Midland Red D9 double decker proudly showing it’s regular “245 Wednesbury via Brierley Hill” display. The route and number haven’t existed for many years, but it epitomises a huge part of local history. Everyone in the 1960s knew the 245. And I mean everyone. It lived in people’s psyche, even if it wasn’t ordinarily the topic of conversation in the pub. And thus local bus numbers – to regular bus users at least – occupy a part of their mind that equals mobility. Understanding and familiarising yourself with a local bus network means you can get around. But the other part of my mind also understands the attraction of new numbers. I asked Centro people ages ago why they felt the need for such radical measures, such as to renumber a classic route such as 558 into “1”. They told me that research showed that people remembered a 1 or 2-digit number more than a 3 digit one. I’m not entirely convinced by that train of thought but I get the “simplification” idea – especially to potential new users. Although “8” actually fits nicely into the Wolverhampton renumbering scheme of a couple of years ago, it sparked an attempt at a conversation from our bus driver to us 3 passengers on the bus, just a few days after the revision had taken place. Mildly disgruntled, maybe. But at least he’d “got it”. I wonder how many had missed this hourly service by looking out for an “891”, already confused by the competition on the route – and was the opposition – still using the old number – gaining an advantage through familiarity? Here’s another thought. Regulars know the score. They know all the little foibles. But to “outsiders” – or “non-regular users”, we’ll call them – buses are a bit of a mystery. What is the 891? The 892? (one of them was a slight variant of the other). What is an 8A? What about 297A? 9E? X96? The picture illustrating this piece shows an image from a bygone age. Birmingham City Transport used all sorts of letters from the alphabet to show short or varied runnings of routes. In today’s West Midlands, only “A” and “E” survive (“A” to show some sort of variant route, or “anti-clockwise” in the case of circular routes, “E” meaning “exception” – normally a short run on a route terminating earlier than the route normally does). But even these create doubt and uncertainty to non-regular users. So even if most regulars in the Black country village of Sedgley grew up knowing the 558 would take them in one direction to Dudley, and the other to Wolverhampton, does the cleaner-sounding “1” subliminally sound somehow easier to non-regulars? More accessible? Of course, it has to be part of a wider package, that might include a high frequency (no need for a timetable, one will be along in a few minutes) and a really simple fare structure (flat fare? Or a day ticket that takes the hassle out of keep finding change). Put these ingredients together and you take the mystique out of using the bus, so that the person using the bus once a year to drop the car in for it’s annual MOT might just consider using it again…. I was riding to Telford days after the biggest upheaval in their local bus network for years. The bus station didn’t look like a battleground with passengers roaming around post-zombie apocalypse. Instead, there was decent information and tabarded Arriva staff available to ask questions of. Whether it settles down to be successful or not, who knows? In Stoke-on-Trent, First are shortly embarking on yet another upheaval – I don’t know how many there have been in recent times, but they are clearly struggling to get it right. Such is the danger when you throw all the eggs up in the air – you don’t always know how they are going to fall. And the “consultation” of users is another double-edged sword. People don’t naturally like change, or indeed radical change. Ask a user what they’d like, and they’ll want something from their front door to exactly where they want to go – in effect, a taxi. When they don’t get that, you can bet the local newspaper letters page will be full of comments about it. Local Councillors also pile in – it gives them a golden opportunity to prove that they’re “listening”, and that some of them know all of the answers. If only. Of course, passenger views are vital, but their expectations are sometimes difficult to satisfy. One of the outcomes of the Telford review is a “new” link between Wolverhampton and Telford, which rambles around several villages, the picturesque Shropshire town of Bridgnorth and the tourist magnet Ironbridge. I say “new”, because it is basically the knitting together of two previously separate services to make one long one. But, crucially, it doesn’t involve changing bus, and has one simple new route number – 9. So if I’m in Wolverhampton, I can now access beautiful Ironbridge in one simple bus ride. Of course I could get there before, but that involved changing in Bridgnorth. Thus, what I was discussing earlier has borne fruit. It’s now simple. There’s still work to be done though. The new Arriva timetable leaflet shows an advert for a “Day Saver” ticket. “Unlimited travel across the Telford area all day – £4.20 local day saver, £4.70 day saver plus”. What it doesn’t show is what the differences are, or where these boundaries might be. Later on the Internet, I looked at Arriva’s often difficult to navigate website, and vaguely came to the conclusion that neither would have been valid to or from Wolverhampton, and the more expensive £6.20 “all areas” ticket was my option. This was, in fact, what I had bought to travel on both Wolverhampton – Telford services, but that was only an educated guess on my part, because I had a basic knowledge of it. So. Network revisions and route renumbering. Short-term pain for long-term gain? Centro claims numbers are up for areas where they have implemented network reviews in the West Midlands. In that case, job done. But we know in others that it hasn’t always worked. Commercial bus operators live in uncertain times. They have to try new things. And we also know that, of course, travel habits change. Places of work change, new facilities open. The Black Country girl of 40 years ago would barely recognise the effect the sprawling Merry Hill Centre has had on the local bus network. Many local services now go there, because it’s where people want to go – they work there, shop there and spend their leisure time there. The traffic there also has a major effect on reliability of buses, but when you’re a commercial operator, you go where the people want to go. Just like when thousands crammed onto rear-entrance double deckers sixty-plus years ago to go to work in huge factories – they have long-since disappeared, along with the demand for the bus service to that area. Making services simpler to understand and taking the confusion out of bus networks is the holy grail of successful bus operation. But it’s often a fine balancing act! Maybe the blog has been a bit “whingy” recently. Heaven forbid! I’m a cheerleader for the bus industry, because I want to see it succeed. So today, I took myself off to the salubrious surroundings of Solihull to have a ride on several brand-spanking new buses. 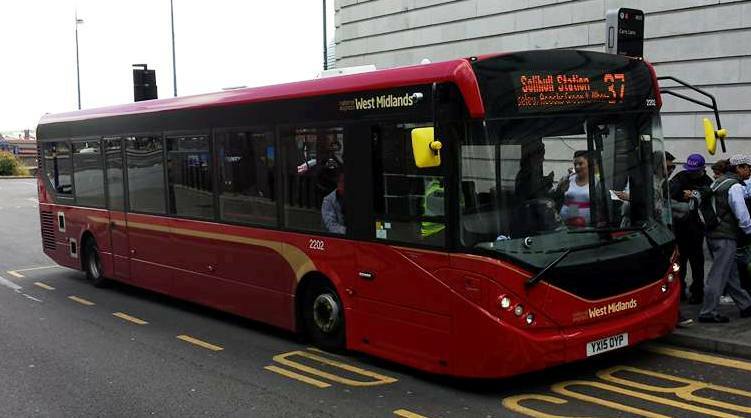 National Express West Midlands has been splashing the cash. Quite a lot of cash as it goes – £34m this year alone on 171 new buses. Part of the new order is the batch of premium double deckers, branded as “Platinum”. The first of these are on the trunk 900 service serving Birmingham City Centre, Airport/NEC and Coventry. Following hard on their heels, the 957 – which shares part of it’s route with the 900 at the Birmingham end – are now also seeing the posh offerings, with next-stop announcements, wifi, extra leg-room and half-leather/half moquette seating. They’re seriously cool. Next up for the Platinum brand will be routes serving North Birmingham and Walsall, including the fast X51 as well as the 934/5/6 and 997. Also appearing on the streets of Solihull are some new single deckers. The new version of ADL’s Enviro 200 are the first to enter service anywhere. Decked out in the extremely classy new National Express West Midlands livery of two-tone crimson, these are “standard” offerings (rather than wifi, etc). Initially debuting on route 37 along Warwick Road between Solihull and the City, they run to basic 5 minute frequency during the daytime. These single deckers are also going to be used on the 71/72 route from Solihull towards Chelmsley Wood and Sutton Coldfield – which sees competition on part of the route from independent Social Travel. There isn’t too much more to say. I shuttled back and forth between The City and Solihull, using one route, than the other. Solihull has some long-term roadworks going on in the centre, so there is a bit of long-winded diversion action for those routes going down to the railway station. What is really noticeable though, is the constant stream of new buses appearing in the West Midlands. I’m not entirely hung-up over whether a bus is “brand new” or “refurbished” – I’ve seen some really excellent refurbs around – but what is evident is the uplift in quality, especially for bus users of the 37/957 services. 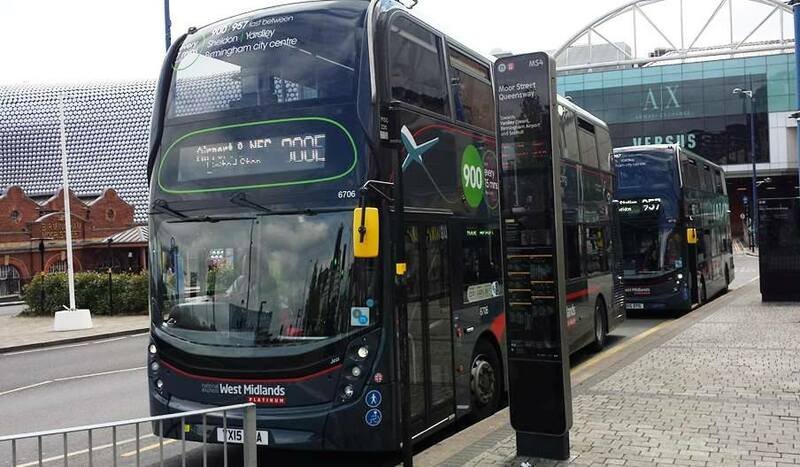 On the face of it, the long-running partnership between National Express West Midlands and Centro is bringing some real improvements to the West Midlands bus scene. What more, significantly, could a Quality Contract bring? Not a huge lot more in my opinion – which is why I still don’t really see the point of them in their current form. It’s now up to the Councillors and Politicians – who of course were happy to pose in front of the shiny new buses – to really drive forward highway improvements that will improve journey times and make these smart new buses even more attractive. Ah – sorry. I promised I wouldn’t whinge on this blog! Of all the tributes paid today as we remember the 10-year anniversary of 7/7, this Independent article is perhaps one of the most powerful. Reading it certainly upset me a lot. Ordinary people, going about their daily lives. A woman, two months away from marrying her fiance, a civil engineer who raised money for his local hospital, the advertising man who came up with the slogan “who would you like to have a one-to-one with?”, the woman who’s daughter had come to London to see her, but they missed each other before the tragedy struck. Countless others, good, decent people, who happened to be on public transport at just the wrong moment. I was in Wolverhampton ten years ago today. In the City Centre, I was hosting a Bus Users Surgery. It was a normal, bustling day and people were hopping on board to tell us their views about the local bus service. As news came in, the Police advised us to close our event down. How could we have continued anyway? Riding home that day on the 256, I vividly recall a strange mix of emotions. Sadness, of course. Real, strong sadness. Apprehension – was this something that was going to happen elsewhere across the country? Anger. Why had these people chosen to do this? Why on public transport? Fear. Not particularly for myself, but would I know, in the coming hours and days, any of those who had been killed in London? As it turned out I didn’t. But that’s hardly the point. They were fellow human beings. We all rub along together, doing our thing, going to work, out shopping, down the pub, in the shops. In my “day job” on public transport, I see the same faces regularly. I don’t “know” some of them, but I feel I do. We nod our heads, mumble “morning” and don’t really think about it. It’s mundane, but if you take it away, it’s something you miss intently. When I had months off work due to sickness, I really missed those moments, just “taking part” in society. 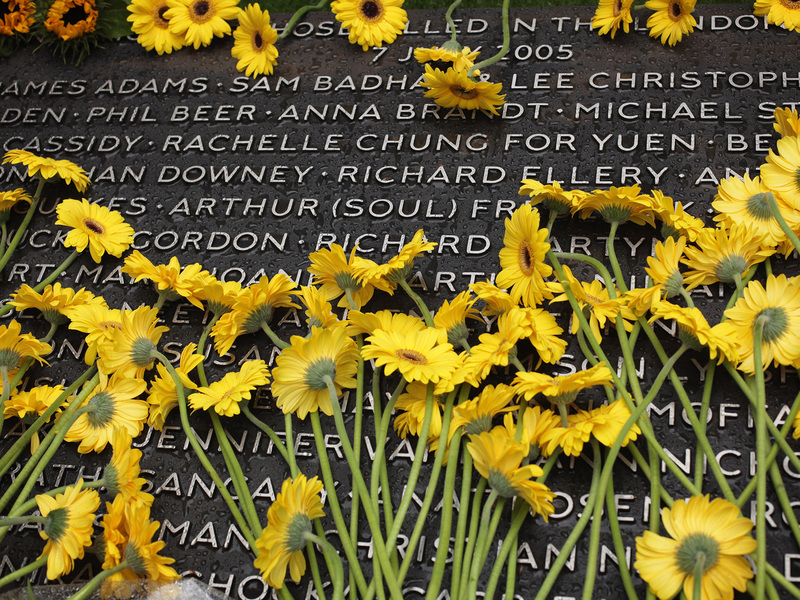 For those caught up in the events of 7/7, today of course will bring back terrible memories. For those who lost loved ones, I can’t even begin to imagine what it must be like. Public transport is open. It is what connects us, delivers us to our workplace, takes us shopping and brings us home again after a night out. It is also vulnerable to extremists who want to carry out their evil deeds. Nothing the public transport family can do will stop a determined individual carrying out something atrocious in the future. We can only carry on, as people, with our daily lives and hope that, eventually, we can find a way to overcome this poisonous ideology that leads people to do such things.